Many people first learn about DevOps when they see one of its outcomes and ask how it happened. It’s not necessary to understand why something is part of DevOps to implement it, but knowing that—and why a DevOps strategy is important—can mean the difference between being a leader or a follower in an industry. Maybe you’ve heard some the incredible outcomes attributed to DevOps, such as production environments that are so resilient they can handle thousands of releases per day while a “Chaos Monkey” is running around randomly unplugging things. This is impressive, but on its own, it’s a weak business case, essentially burdened with proving a negative: The DevOps environment is resilient because a serious failure hasn’t been observed… yet. Tech industry professionals frequently weigh in with a wide range of answers. How would you respond? Lean seeks to continuously remove waste and increase the flow of value to the customer. This is easily recognizable and understood through a core tenet of lean: single piece flow. We can do a number of activities to learn why moving single pieces at a time is magnitudes faster than batches of many pieces; the Penny Game and the Airplane Game are two of them. In the Penny Game, if a batch of 20 pennies takes two minutes to get to the customer, they get the whole batch after waiting two minutes. If you move one penny at a time, the customer gets the first penny in about five seconds and continues getting pennies until the 20th penny arrives approximately 25 seconds later. This is a huge difference, but not everything in life is as simple and predictable as the penny in the Penny Game. This is where agile comes in. We certainly see lean principles on high-performing agile teams, but these teams need more than lean to do what they do. To be able to handle the unpredictability and variance of typical software development tasks, agile methodology focuses on awareness, deliberation, decision, and action to adjust course in the face of a constantly changing reality. For example, agile frameworks (like scrum) increase awareness with ceremonies like the daily standup and the sprint review. If the scrum team becomes aware of a new reality, the framework allows and encourages them to adjust course if necessary. For teams to make these types of decisions, they need to be self-organizing in a high-trust environment. High-performing agile teams working this way achieve a fast flow of value while continuously adjusting course, removing the waste of going in the wrong direction. This can be explained with an analogy about grocery shopping. Suppose you need to buy some eggs and you live 30 minutes from the store. Buying one egg (far left on the illustration) at a time would mean a 30-minute trip each time. This is your transaction cost. The holding cost might represent the eggs spoiling and taking up space in your refrigerator over time. The total cost is the transaction cost plus your holding cost. This U-curve explains why, for most people, buying a dozen eggs at a time is their optimal batch size. If you lived next door to the store, it’d cost you next to nothing to walk there, and you’d probably buy a smaller carton each time to save room in your refrigerator and enjoy fresher eggs. This U-curve optimization illustration can shed some light on why productivity increases significantly in successful agile transformations. Consider the effect of agile transformation on decision making in an organization. In traditional hierarchical organizations, decision-making authority is centralized. This leads to larger decisions made less frequently by fewer people. An agile methodology will effectively reduce an organization’s transaction cost for making decisions by decentralizing the decisions to where the awareness and information is the best known: across the high-trust, self-organizing agile teams. The following animation shows how reducing transaction cost shifts the optimal batch size to the left. You can’t understate the value to an organization in making faster decisions more frequently. Automation is one of the things DevOps is most known for. The previous illustration shows the value of automation in great detail. Through automation, we reduce our transaction costs to nearly zero, essentially getting our testing and deployments for free. This lets us take advantage of smaller and smaller batch sizes of work. Smaller batches of work are easier to understand, commit to, test, review, and know when they are done. These smaller batch sizes also contain less variance and risk, making them easier to deploy and, if something goes wrong, to troubleshoot and recover from. With automation combined with a solid agile practice, we can get our feature development very close to single piece flow, providing value to customers quickly and continuously. More traditionally, DevOps is understood as a way to knock down the walls of confusion between the dev and ops teams. In this model, development teams develop new features, while operations teams keep the system stable and running smoothly. Friction occurs because new features from development introduce change into the system, increasing the risk of an outage, which the operations team doesn’t feel responsible for—but has to deal with anyway. DevOps is not just trying to get people working together, it’s more about trying to make more frequent changes safely in a complex environment. We can look to Ron Westrum for research about achieving safety in complex organizations. In researching why some organizations are safer than others, he found that an organization’s culture is predictive of its safety. 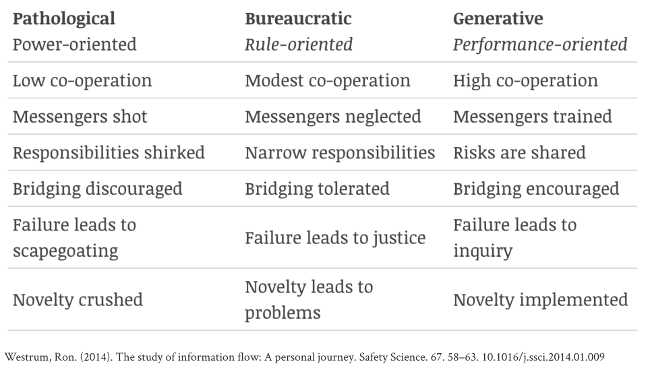 He identified three types of culture: Pathological, Bureaucratic, and Generative. He found that the Pathological culture was predictive of less safety and the Generative culture was predictive of more safety (e.g., far fewer plane crashes or accidental hospital deaths in his main areas of research). Effective DevOps teams achieve a Generative culture with lean and agile practices, showing that speed and safety are complementary, or two sides of the same coin. By reducing the optimal batch sizes of decisions and features to become very small, DevOps achieves a faster flow of information and value while removing waste and reducing risk. In line with Westrum’s research, change can happen easily with safety and reliability improving at the same time. When an agile DevOps team is trusted to make its own decisions, we get the tools and techniques DevOps is most known for today: automation and continuous delivery. Through this automation, transaction costs are reduced further than ever, and a near single piece lean flow is achieved, creating the potential for thousands of decisions and releases per day, as we’ve seen happen in high-performing DevOps organizations. DevOps doesn’t stop there. We’ve mainly been talking about DevOps achieving a revolutionary flow, but lean and agile practices are further amplified through similar efforts that achieve faster feedback loops and faster learning. In the DevOps Handbook, the authors explain in detail how, beyond its fast flow, DevOps achieves telemetry across its entire value stream for fast and continuous feedback. Further, leveraging the kaizen bursts of lean and the retrospectives of scrum, high-performing DevOps teams will continuously drive learning and continuous improvement deep into the foundations of their organizations, achieving a lean manufacturing revolution in the software product development industry. The first step in leveraging DevOps is, either after much study or with the help of a DevOps consultant and coach, to conduct an assessment across a suite of dimensions consistently found in high-performing DevOps teams. The assessment should identify weak or non-existent team norms that need improvement. Evaluate the assessment’s results to find quick wins—focus areas with high chances for success that will produce high-impact improvement. Quick wins are important for gaining the momentum needed to tackle more challenging areas. The teams should generate ideas that can be tried quickly and start to move the needle on the DevOps transformation. After some time, the team should reassess on the same dimensions to measure improvements and identify new high-impact focus areas, again with fresh ideas from the team. A good coach will consult, train, mentor, and support as needed until the team owns its own continuous improvement and achieves near consistency on all dimensions by continually reassessing, experimenting, and learning. In the second part of this article, we’ll look at results from a DevOps survey in the Drupal community and see where the quick wins are most likely to be found. Rob Bayliss and Kelly Albrecht will present DevOps: Why, How, and What and host a follow-up Birds of a Feather discussion at DrupalCon 2019 in Seattle, April 8-12. Read more about Why DevOps? Convince your boss in 5 minutes. Why DevOps? Convince your boss in 5 minutes.